Mom told me a story. “I put my foot in my shoe, and I could feel something in there. 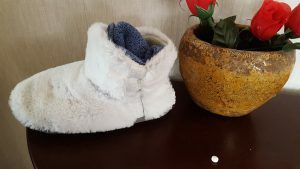 I dumped out my shoe, and nothing came out.” She checked her slipper. Nothing. Then she dumped out her sock. Of all things, a pill came out. Apparently, Floyd lost a vitamin-D pill a few days ago. How it landed in her sock, no one will ever know. However, she apparently hadn’t heard the story, The Princess and the Pea, so my comment, “You’re the Princess,” didn’t make any sense to her. Floyd thought it was funny though.